This week I am attending an Advanced Catholic Training in which we seek to explain certain aspects of the faith to young people. Today I learned too very important lessons from young people. The first lesson is a reminder of how - in certain ways - I am very much behind the times. I had pulled out my calendar/planner to check on a couple of dates and placed it near a bottle of DrPepper Then. A few minutes later someone said with a note of surprise, "What is that?!" Thinking he was referring to the DrPepper Ten, I started to explain when he interrupted, saying something like, "No, that book." He then explained that no one these days keeps a paper calendar. The second lesson concerns the mind of God. I was helping one of the groups prepare for Mass this evening when I reminded the lector to pay attention to the tone of the reading. 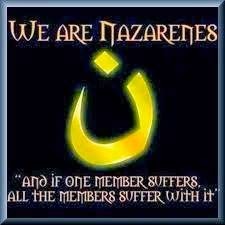 After explaining that God was challenging his people I was told, "If God were really angry he would have used caps lock." Worshippers attending Mass at Brentwood Cathedral in Essex had a rude experience when a large block of ice fell through the roof during the Eucharistic Prayer. Fr James Mackay told BBC Essex: “Last Sunday just gone, I was celebrating Mass and halfway through there was a massive explosion to the west side of the cathedral. Fr Mackay said: “It became clear later on that it was actually a block of frozen refuse that dropped from an aeroplane. We could see the damage – it fell straight through the slate… It was a bit of an adventure” [more]. I often joke with people that we never know when death will come, that we might be struck by a meteor in a few minutes. I suppose the likelihood of being struck by falling objects might be higher than I anticipated. If you don't want to know when you'll die, I don't recommend looking up too much; best to be caught off guard. If you haven't yet seen it, you really showed; it's a very powerful and moving film. Being one who frequently suffers from a bit of wanderlust, I have often wondered what it might be like to make that pilgrimage across the Spanish countryside. The Way only increased this curiosity. About the time the film came out a friend gave me Kevin A. Codd's To the Field of Stars: A Pilgrim's Journey to Santiago de Compostela, a very interesting book recounting one priest's journey on this holy road and the lessons he learns on the way, both simple and profound, and the people he encounters. It is a easy book to read and is broken up into short chapters, each describing one day's journey toward Compostela. Every pilgrimage, however great the distance, is not so much about the final destination and arrival, but about the journey undertaken by the soul towards God. Every pilgrimage is really meant to help come to a deeper understanding of the final destiny of man, either with God or without him. After Vatican Council II, there was much talk of the faithful as the "pilgrim people." Certainly, we are the pilgrim people making our way - please, God - toward the Lord even as we cry out to him each day, "Let us see your face, O Lord, and we shall be saved" (Psalm 80:4). But, as Father Codd rightly points out, "Once talk of being 'a pilgrim people' replaced being a people who actually walk as pilgrims we rather lost our way" (23). The feeling that is yet so much deeper (76-77). It is no small feat (pun intended) to actually walk the camino, for the full journey takes some forty days. Nevertheless, my heart desires one day to walk that road that so many others have walked before me. In truth, a pilgrimage can be made anywhere, so long as the destination is a sacred place. You can choose to make a pilgrimage to a nearby shrine, a chapel with Eucharistic adoration, your parish church, or the grave of Father Augustine Tolton or one of the saints. Bidden or unbidden, God is present. That is exactly what I am coming to understand on this road: Like the star above me, seen or unseen, he is here. Felt or unfelt, he is with me. Attended to or not attended to, he is walking with me (142). The whole process of copying the 4,600 pages took right about six hours (I miscalculated in Twitter tweet @daren_j_zehnle). 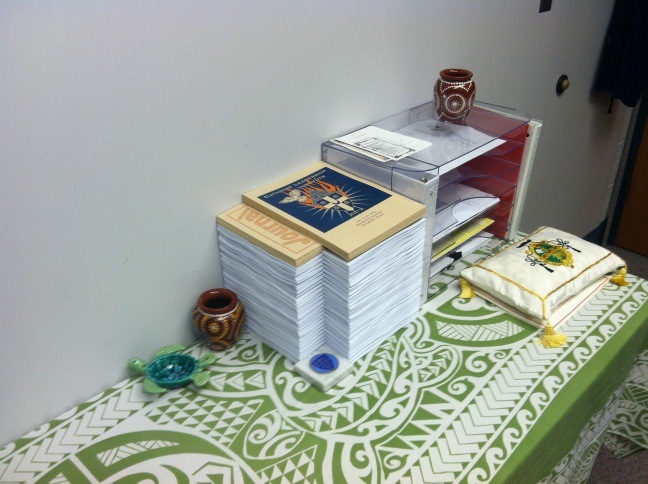 Tomorrow morning the pages will be bound in between the covers with those plastic spiral things. If you or someone you know would still like to register for CLI - or for ACT - there is still time to do so, though not much. Some weeks ago a few Catholic men in Pittsfield wanted to find a way for them to express their faith in a simple manner while also focusing attention on the importance of Sunday in the life of the Christian. Their prayer group of twelve men saw an article about white crosses placed on their private property every Sunday. Now every Sunday Pittsfield is filled with white crosses. They named their project Crosses for Chirst and it quickly took on an ecumenical nature. For a cost of $5, the group will make a cross, paint it white, and install an insert into your yard that can easily be mowed over. Update: To date, 700 homes in Pike County (Illinois) have the crosses in their yards, with an additional 10-20 homes per week. In the midst of a very busy week (I'm preparing to serve as the Spiritual Director for Great River Teens Encounter Christ #281 July 14-16; a Catholic Leadership Institute July 15-20; and an Advanced Catholic Training July 23-26), I've had the welcome blessing of being able to visit a number of good friends whom I haven't seen in a while. Looking at the base of the grave, I was very happy to see more flowers there Monday morning than were there when I visited the grave Sunday evening. 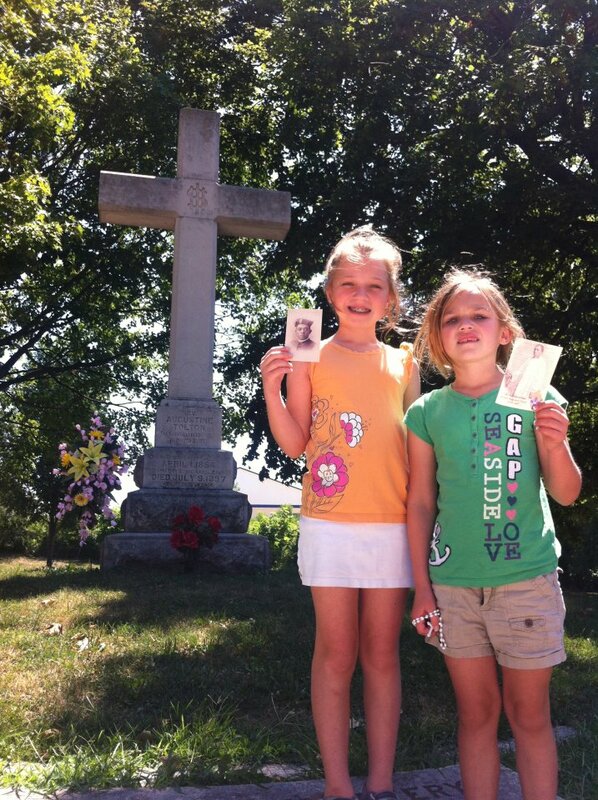 Seeing their picture, I thought it would be nice to have an ongoing feature on this blog of pictures of people at the grave of Father Tolton. If you visit his grave, please, after praying there, take a picture and, if you don't mind, send it my way to post here (I'll have to do it myself sometime). This would be one more sign of devotion to Father Tolton and would be a good help to the Cause for his Beatification and Canonization. Thanks! Today marks the 115th anniversary of Quincy's first citizen, the Servant of God Father Augustus John Tolton, whose Cause for Beatification and Canonization, thanks be to God, continues to move forward. Having just returned to Chicago from a retreat in Bourbonnais, Illinois, Father Tolton collapsed of heat stroke in 105 degree weather. He died at Mercy Hospital at the age of 43, having been a priest for 11 years. Complete what you have begun in us that we might work for the fulfillment of your kingdom. Not to us the glory, but glory to you O God, through Jesus Christ, your Son and our Lord; Father, Son and Holy Spirit, you are our God, living and reigning forever and ever. Amen. 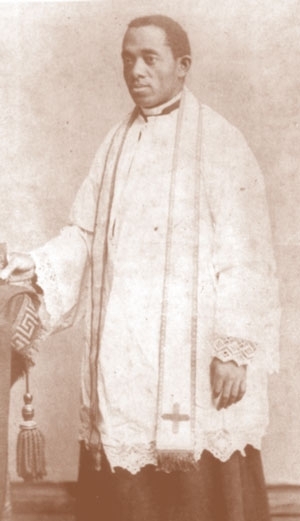 God our Father, you have found Father Augustus Tolton to be an obedient servant of Christ our eternal high priest and a faithful steward of the mysteries of God. Father Tolton’s sharing in the Cross of our salvation led him to a life of long suffering in the face of prejudice and misunderstanding, which produced within him the fruits of a great joy and a humble love for you and for your people. His zeal for the priestly ministry shines brightly before us in this Diocese of Springfield in Illinois in which he served, illuminating for us the path to you. Through his example and intercession, may many young men within this Diocese respond with generous and courageous love to your Son’s invitation to share in his priesthood so that each of your altars in this Diocese may be served by such a faithful priest as this Servant of God. Perry: "[Tolton's] your first citizen"
His Excellency the Most Reverend Joseph N. Perry, Auxiliary Bishop of Chicago and Diocesan Postulator of the Cause for the Beatification and Canonization of the Servant of God Father Augustus Tolton yesterday spoke to a group of Quincyans - and others - about Father Tolton, saying, "He's your first citizen." He spoke yesterday at a panel discussion on Father Tolton's life in Blessed Sacrament parish in Quincy, together with Fathers Roy Bauer, Peter Harman, and Joseph Zimmerman, O.S.F. About 150 people came to listen to learn more about the Servant of God, to ask questions, and to collect a few devotional items. Father Bauer spoke of the Tolton's life in Missouri before Father Gus' mother Martha Jane escaped from slavery when Gus was only seven years old. Father Zimmerman spoke of Father Gus' life and travels from Brush Creek, Missouri to Quincy, Illinois, to Rome, Italy, to Quincy, Illinois, to Chicago, Illinois and of the adversity he faced. Father Harman spoke of the difference between those who are motivational and those who are inspirational. Motivation, he said, comes from one's own self, whereas inspiration comes from God. Those who are motivational speakers draw on their own abilities and talents to try to help others, whereas those who inspire others rely on the grace of God. He spoke largely of two ways that Father Tolton is an inspiration to us. First, in his complete trust in the power of God when he was powerless, and, second, of his perseverence. Father Tolton persevered over a fear of what was unknown and of what was known. Bishop Perry spoke of the process of beatification and canonization. The Cause for Father Tolton is progressing along nicely. 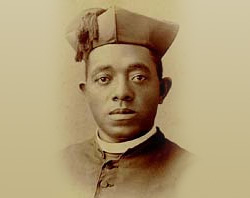 Last week he present two healings to the Holy See for consideration as miracles and it is expected that the archival record of Father Tolton's life will be completed within a year's time. Let us pray the Lord to glorify his servant, Father Tolton. Santo subito! Twice in today’s first reading the Lord says to Ezekiel, “I am sending you” (Ezekiel 2:3, 4). If anyone hears the Lord say, “I am sending you,” he would be justified in being concerned, for the Lord sent Ezekiel to “rebels who have rebelled against me,” to those “hard of face and obstinate of heart” (Ezekiel 2:5, 4). He sent Saint Paul to both pagan unbelievers and to Christians rife with discord. Even Jesus went to those “who took offense at him” (Mark 6:3). The task of the prophet, the mission of the one sent by the Lord, is “to bring glad tidings to the poor,” to announce that “they have been rescued from slavery to sin,” and to call them to a life of repentance (Luke 4:18). But “whether they heed or resist – for they are a rebellious house – they shall know that a prophet has been among them” (Ezekiel 2:5). One such man, the Servant of God Father Augustus John Tolton, whose cause for beatification and canonization is underway as we pray the Lord to confirm that a prophet has been among us, died one hundred and fifteen years ago this Monday, and his life is intimately connected with our Diocese; in fact, his body is buried in Quincy. His was a life seemingly marked by opposition wherever he turned, save for a few moments of calm. In Father Tolton, we find one who, with Saint Paul, trusted in the Lord’s words: “My grace is sufficient for you, for power is made perfect in weakness” (II Corinthians 12:9). This servant of God was born April 1, 1854 in Ralls County, Missouri to faithful Catholic parents, Peter Paul and Martha Jane Tolton, who were slaves near Brush Creek, Missouri. In 1862, Martha heard talk of slave traders in the area looking for children. Having herself been separated from her parents when she was sixteen, she feared for her children and fled the farm. After a harrowing escape through fields and over the Mighty Mississippi, they finally arrived in Quincy, Illinois, forty-one miles away; Augustus was only seven. In 1865, he enrolled in St. Boniface school with the permission of the pastor, Father Schaeffermeyer and found those both “hard of face and obstinate of heart” (Ezekiel 2:4). His enrollment led many to threaten to remove their children from the school, to leave the parish, and even to call for the removal of their pastor. Just one month after he enrolled, young Gus withdrew from the school; he was ten years old. When he was twenty-four, he opened St. Joseph School of Black Children in Quincy, the first of its kind in the city. Even here he was met with opposition, when black Protestants publicly refused to send their children to his school because he was Catholic. Five years later, he was ordained a deacon. He later said: “The day I was ordained deacon, I felt so strong that I thought no hardship would ever be too great for me to accept. I was ready for anything; in fact, I was very sure I could move mountains – in Africa.” He had spent all of his spare time studying the geography and cultures of Africa, certain he would be sent there, but the Lord’s ways are not our ways (cf. Isaiah 55:8). The day before he was ordained a priest, Giovanni Cardinal Simeoni told Deacon Tolton it was decided the night before that he would be sent Africa, but the Cardinal over-ruled the decision. “America has been called the most enlightened nation in the world,” he said. “We shall see whether it deserves that honor. If the United States has never before seen a Black priest, it must see one now!” He was sent home, to Quincy. It was shocking news, but he had already promised his obedience. He must have remembered the difficulties of his childhood and early adulthood in the United States, but he trusted in the Lord even as he surely heard his words: “A prophet is not without honor except in his native place and among his own kin and in his own house” (Mark 6:4). Would the people take offense at him as they took offense at Jesus (cf. Mark 6:3)? He arrived in Quincy in July of 1886 and was appointed Pastor of St. Joseph’s Parish, which had been established as a parish for Blacks. He received an enthusiastic welcome in the Gem City and was admired by all. They found in him a “rich and full voice which falls pleasantly on the ears” and saw the “whole-hearted earnestness” with which he went about his ministry. His ministry met with some success, but affairs turned for the worse when Father Michael Weiss was appointed Pastor of St. Boniface Parish, just one block from St. Joseph’s, for it was Father Weiss who took great offense at Father Tolton. St. Boniface Parish was in debt and had given much to St. Joseph’s Parish. Many of Father Weiss’ parishioners attended Father Tolton’s Masses and contributed to his parish. Father Weiss forbade Father Tolton from ministering to whites and repeatedly made it clear that contributions from whites belonged to white parishes. This was the first time Father Tolton experienced prejudice from a priest, and it devastated him. There is a certain German priest here who is jealous and contemptuous. He abuses me in many ways and he has told the bishop to send me out of this place. I will gladly leave here just to be away from this priest. I appealed to Bishop [James] Ryan and he also advises me to go elsewhere. Just twelve days later, he left for Chicago with nineteen of his converts and took up the pastorate of St. Monica’s chapel, where he was entrusted with the pastoral care of all of Chicago’s black Catholics. After he left Quincy, St. Joseph Parish closed for good. From the beginning, his “ardent charity and self-denying zeal” were evident to all. Within two years he began construction on a new church – that was never completed – and ministered to some six hundred black Catholics. Having spent himself in the service of the Church, he died of heat stroke in 105 degree weather on July 9, 1897, one hundred and fifteen years ago this Monday; he was forty-three years of age. St. Monica’s became a mission and it took another two years for a full-time pastor to be assigned to it. St. Monica’s closed for good in 1924. I was a poor slave boy but the priests of the Church did not disdain me. It was through the influence of one of them that I became what I am tonight… It was the priests of the Church who taught me to pray and to forgive my persecutors. It was through the direction of a Sister … that I learned to interpret the Ten Commandments; and then I also beheld for the first time the glimmering light of truth and the majesty of the Church. In this Church we do not have to fight for our rights because we are Black. She had colored saints – Augustine, Benedict the Moor, Monica. The Church is broad and liberal. She is the Church for our people. Despite the opposition he faced, he never lost his love of the Church or of the priesthood, and never did he condemn Father Weiss or speak ill of him. Throughout his life, Father Tolton remained “content with weakness, insults, hardships, persecutions, and constraints, for the sake of Christ” (II Corinthians 12:10). In this he is a model for each of us; never did he cease his proclamation of the Gospel. As Father Roy Bauer has said, “Some people could easily judge that his life was not a success, but God calls His servants to be faithful, not successful!” The fidelity of Father Tolton cannot be doubted, and for this reason he is a model for us all and a continual reminder that “when I am weak, then I am strong” (II Corinthians 12:10). Father Tolton found his place of refuge in the Lord and now we pray that he will be declared Blessed and raised to the dignity of the altars (cf. Psalm 34:9). May his example and intercession raise up many more such faithful and devoted priests in our Diocese, that each of the Lord’s altars may have a priest to administer the mysteries of God. Amen! Collect of the Day, Roman Missal. Roy Bauer, They Called Him Father Gus: The Life and Times of Augustine Tolton, First Black Priest in the U.S.A., Part Eight. The Quincy Journal, July 26, 1886. In They Called Him Father Gus, Part Twenty-four. Mary Elmore in Ibid., Part Twenty-seven. In honor of the 236th anniversary of the establishment of these United States of America, I wish to provide a little musical entertainment for you. Please don't mind the cheering crowds. 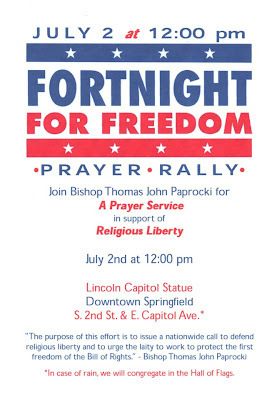 If you only know local news stories through the State Journal-Register, you'd never know that some two hundred people - of all ages and backgrounds - joined Bishop Paprocki in prayer for religious liberty in the heat of the Noon-day sun yesterday outside the State Capital. No coverage was given in either the print or online editions, and you know: If the media doesn't cover it, it didn't happen. It was certainly a very hot afternoon, but as I sat and stood roasting in my cassock I kept thinking one thought: It could be hotter (it was only, I think, 97 degrees and Sunday we reached at least 99 degrees). One doesn't want to make too much of these sort of things, of course, but as we stood for the Alleluia before the Gospel, I couldn't help but notice at that moment a breeze came through the area and even turned the page in the binder at the podium to the Gospel passage (it did my work for me! If you watch closely, you can see it in the video). In that breeze, it seemed the hand of Providence was upon us. Now word has reached me that it is raining in Effingham. The sun is shining in Springfield. I suppose in the future I need to be more specific in my request. Don't forget to join us! 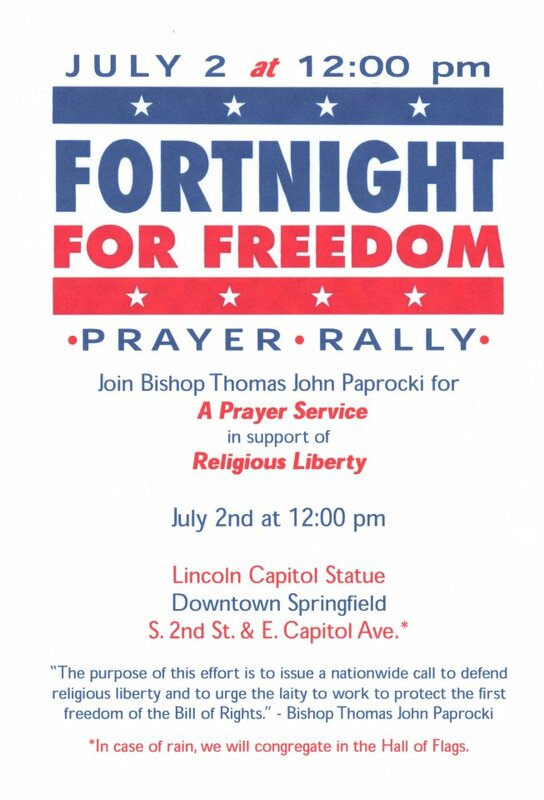 It will be a good penance to stand in the heat of the day praying for the protection and restoration of our religious liberty. N.B. : As I understand it, the ceiling of the Hall of Flags fell in last week. Now, in case of rain, we will congregate in the rotunda itself. Yesterday I accompanied Bishop Paprocki for the celebrations marking the 175th anniversary of the founding of the parish of St. Mary of the Assumption in Sainte Marie, Illinois, a town founded in 1837 by French Catholics seeking religious liberty. 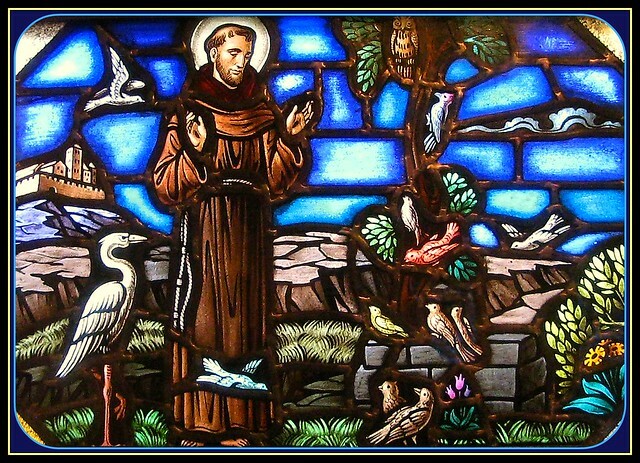 As we made our way from the sacristy to the doors of the church for the procession, I joked to the Deacon, "If Saint Francis were with us today, I think he'd add one more verse to his Canticle of Brother Sun: 'Praised be you, my Lord, through Sister Air Conditioning.'" The Deacon answered, "Would it be 'Sister Air Conditioning' or 'Brother'?" It was a fair question that caught me a bit off guard (I know; by now you're wondering, "Where's he going with this?"). I said that Francis addresses the sun as "brother" and fire as "brother," and then it suddenly occurred to me: No where in his Canticle of Brother Sun does Saint Francis praise the Lord for snow or cold. The Poverello is wiser than I ever knew. At least, he doesn't give praise for snow or cold explicitly. He does, though, through Brother Wind, give praise for "every kind of weather," which, I suppose, could include cold, but that would be a stretch, because he qualifies this praise for every kind of weather "through which you give sustenance to Your creatures." One of these days I need to work on a little theological query as to whether winter is a direct result of the Fall of Adam.